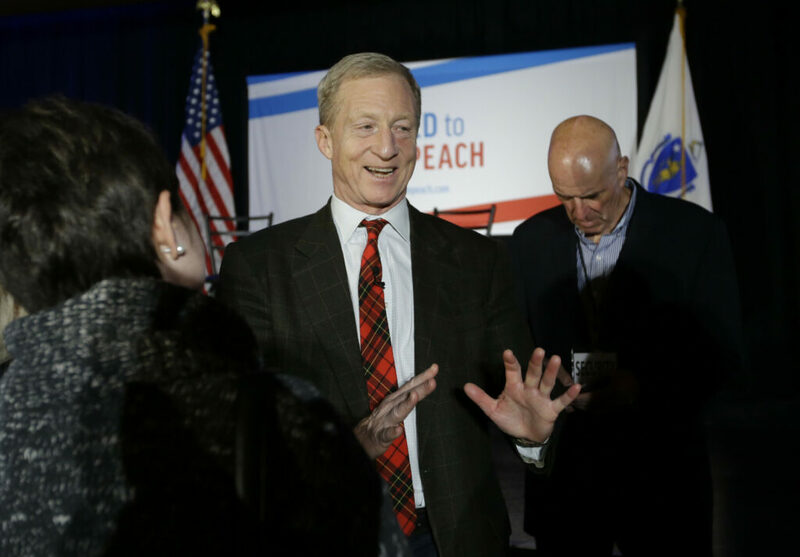 While Democratic leaders have distanced themselves, billionaire Tom Steyer is trying to keep pressure on elected officials in both parties, including Maine Sen. Susan Collins. Billionaire businessman and Democratic megadonor Tom Steyer will speak in Portland on Wednesday as part of a national tour to pressure Congress to support impeachment proceedings against President Trump and to release the full report of special counsel Robert Mueller. Steyer has held dozens of his “Need to Impeach” town hall-style events across the country since last year. He has focused recently on the congressional districts of influential Democratic lawmakers. Wednesday’s event at the Italian Heritage Center appears aimed, at least in part, at Republican Sen. Susan Collins. “Let’s show Republicans like Senator Susan Collins that now is the time to act, and that the country is watching the actions they take against Trump,” reads the online RSVP for the event. A former hedge fund manager, Steyer is now a major donor to Democratic and progressive causes as well as an outspoken activist on climate change and other environmental issues. Since 2017, the San Francisco resident has tried to organize a grassroots effort to push for impeaching Trump on alleged offenses ranging from obstruction of justice to profiting from the presidency and advocating political violence. Yet Steyer’s pressure campaign on impeachment – financed with $80 million of his own money – has created tensions within Democratic ranks. House Speaker Nancy Pelosi and other Democratic leaders have distanced themselves and their caucus from impeachment talk. Earlier this year, Steyer began holding “Need to Impeach” town hall events in the congressional districts of the Democratic leaders of the committees that would be involved in impeachment proceedings. At the time, Steyer and his political action committee suggested such events could also target rank-and-file member districts. Impeachment proceedings begin in the House. If the majority of House members vote in favor of the articles of impeachment, the Senate then holds a trial to decide whether to remove the president from office. It takes a two-thirds vote in the Senate to convict. Neither of Maine’s two House Democrats, Reps. Chellie Pingree and Jared Golden, serve on committees that would be involved in impeachment proceedings. Steyer’s staff did not respond to questions seeking specific reasons for holding an event in Portland, the liberal hotspot of a left-leaning district. In addition to the presidential contest in 2020, Democrats in Maine and national progressive groups are already signaling that they plan to target Collins if the Republican runs for a fifth Senate term, as expected. A Democratic challenger to Collins has yet to emerge, however. No members of Maine’s congressional delegation have publicly called for impeachment proceedings against Trump. The two closest to the action in D.C. are Collins and independent Sen. Angus King because they sit on the Senate Intelligence Committee, which has been investigating Russian interference in the 2016 election. Both Collins and King have called on Attorney General William Barr to publicly release as much of Mueller’s report as possible after redacting any sensitive or classified information. Collins is coming under more public pressure, however, because Republicans control the Senate. Golden, a freshman Democrat who narrowly defeated a two-term Republican in November, has already shown a willingness to buck his party. He voted against Pelosi’s nomination to become House speaker and was among only a handful of Democrats to oppose a gun control measure. Golden has also distanced himself from talk of impeachment, but stopped short of ruling it out, depending on the findings of the Mueller report. “Believe me, I’m going to be ready to do what’s right for this country if we reach that very serious discussion of impeachment,” Golden told the Portland Press Herald in March.